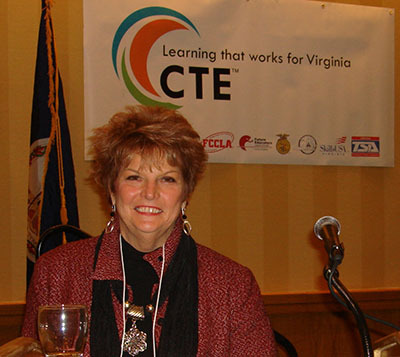 Dr. Brenda Long has devoted more than 30 years to Career and Technical Education (CTE) in Virginia. She earned her undergraduate and graduate degrees in CTE at Virginia Tech before serving as a teacher, assistant principal, and local CTE director in several counties, including Tazewell and Stafford. Brenda’s commitment to CTE has lead to promoting and implementing rigorous CTE programs and ensuring that all students benefit from these programs regardless of their career goals. In this effort, she has worked with policymakers and stakeholders at local, state, and national levels and continues to identify avenues to enhance the visibility of CTE. Brenda has served as president of the Virginia Association for Career and Technical Education (Virginia ACTE), Virginia Association for Career and Technical Education Administrators (VACTEA), and former Virginia Home Economics Teachers Association, now the Virginia Association for Teachers of Family and Consumer Sciences (VATFACS). She has held leadership positions with the Association for Career and Technical Education (ACTE) as a regional policy member and as chair of various committees. Most recently, Brenda has provided public policy leadership as a board member of both Virginia ACTE and VACTEA. She is also a member of the Virginia Advisory Committee for Career and Technical Education. Brenda has been recognized for her accomplishments, most notably twice as the Virginia ACTE Outstanding CTE Administrator and the ACTE Region II Outstanding Administrator, and also as the Family, Career, and Community Leaders of America National Administrator. Brenda’s continued involvement and unwavering commitment to our state association has afforded our Board of Directors the opportunity to bring her onboard as our Executive Director. In this role, Brenda will provide great leadership and strong continuity, both of which are needed to ensure Virginia ACTE’s service to its members and its growth, visibility, and influence throughout the Commonwealth and beyond.